Springtime Manicures and pedicures with Sally Hansen! : Beautify Nails and Pamper Cuticles with Sally Hansen's 18K Gold Collection and Bring Fabric and Texture to Your Manicure with 3 New Sally Hansen Special Effects Collections. You are here: Home / Archived Content / Springtime Manicures and pedicures with Sally Hansen! Springtime Manicures and pedicures with Sally Hansen! Beautify Nails and Pamper Cuticles with Sally Hansen's 18K Gold Collection and Bring Fabric and Texture to Your Manicure with 3 New Sally Hansen Special Effects Collections. Gold is one of the hottest ingredients in beauty, and not just because of its glamorous reputation. It’s one of the most talked-about ingredients in skin care thanks to its remarkable ability to stimulate collagen, boost elasticity, and increase firmness. Now, Sally Hansen brings the unique benefits of this precious metal to nails with 18K Gold Nail Care. This luxe duo instantly treats and beautifies nails and cuticles in just one step, featuring formulas infused with real 18-karat gold that helps nourish, protect, and fortify. 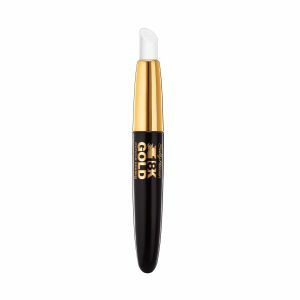 with 18K Gold Hardener and 18K Gold Cuticle Eraser, it’s easy to be the girl with the golden touch-and perfectly manicured nails and cuticles. I received samples of the 18K Gold Hardener and 18K Gold Cuticle Eraser and love them both! I love how the 18K Gold Hardener is easy to use and that it dries really quickly! It can also be worn under and over nail color or by itself. The 18K Gold Cuticle Eraser is my new favorite! It reduces the appearance of rough cuticles. It is easy to use and leaves my feeling softer and hydrated. A real beauty-must-have! Sally Hansen 18K Gold Hardener and 18K Gold Cuticle Eraser retail for $7.49 each and are available at chain drugstores and mass retailers nationwide. I also received a sample of the New Sally Hansen Patent Gloss in such a pretty red shade. The Patent Gloss Nail Polish delivers the eye-catching allure of patent leather with a super shiny, slick finish. I love the color and shine. It is available in four shades: Chic, Moto, Slick and Vinyl. Great for date night! Sally Hansen Special Effects Nail Polish retails for $9.99 and is available at chain drugstores and mass retailers nationwide. Self Disclosure: I received free samples to facilitate this feature. Photo Credit: Sally Hansen.